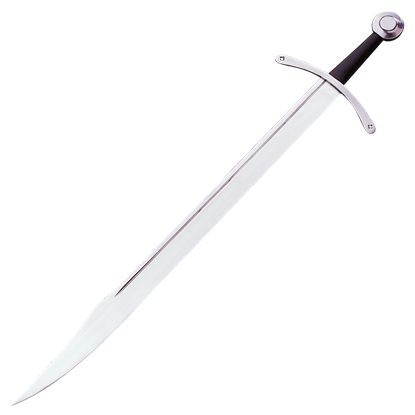 A falchion is a medieval single handed, one edged sword of European origin. 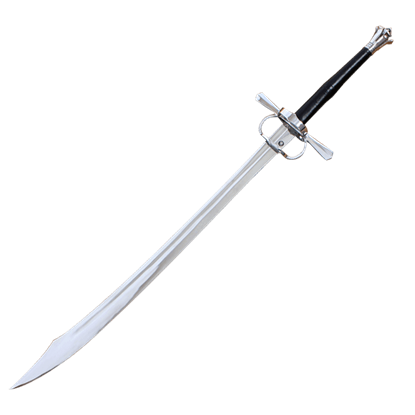 The Falchion sword may come from a French word for a sickle, "fauchon". The back of the sword is either straight or somewhat concave and the edge is convex curve. Falchion swords can be seen in Medieval art being used against lighter armors by infidels as well as footman and even knights. The weapon is entirely European and was derived from the Sax. Some historians say the sword is related to the Dark Age long knife, seax or scramanseax. Some Falchions are shaped like a large meat cleaver or machete. Falchions are found in different forms from around the 11th century up to and including the 16th century. The Falchion sword is thought to be primarily a peasant's weapon and was used in everyday life when not in battle. There are very few actual Falchion swords that have survived to the present day. Our Falchion swords can be used for display or for battle re-enactments, each reproduction is created to the specifications of the original. The dimensions and weight are accurate on every piece so you get a medieval weapon that is actually balanced and fun to hold instead of just pretty to look at. Medieval times were sometimes brutal, sometimes romantic, but always a source of intrigue. We invite you to share in the experience of an era past with our collection of Falchion swords. All our Falchion Swords are expertly hand-crafted and authentic replicas! You can display them in your office, home or for Medieval Reenactments. 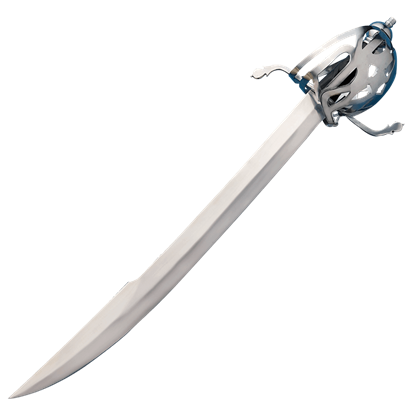 The Demon Broadsword Falchionis for brave warriors seeking a unique weapon with sinister appeal. The stainless steel, single edged blade widens and curves slightly upwards at its end, and detailed skulls decorate the black steel hilt. Although the double-edged sword gets most of the press, the single-edged falchion was favored by a great many knights and men at arms. The wide cutting blade was quite effective against mail thanks to its weight balance. 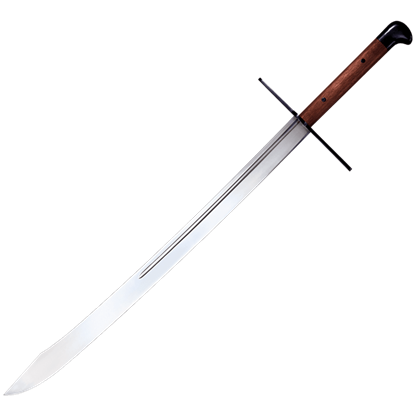 Designed by Luke LaFontaine and Dave Baker, the German Langes Messer is a stunning sword. This modern interpretation of the historical German Long Knife features a clip point blade that is fully sharpened along its primary edge. 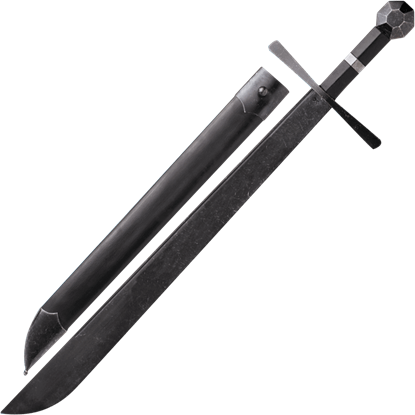 The Grosse Messer Swords heritage hails from central and northern Europe where, in days of old, noblemen and peasants alike relied on it to protect hearth and home from brigands, outlaws, and other characters of ill repute. Appearing in various forms from the 11th to 16th centuries, the falchion remains notable for its single-edged blade, crossguard, and curved blade tip. The Hattin Falchion features a disc pommel with octagonal facets. 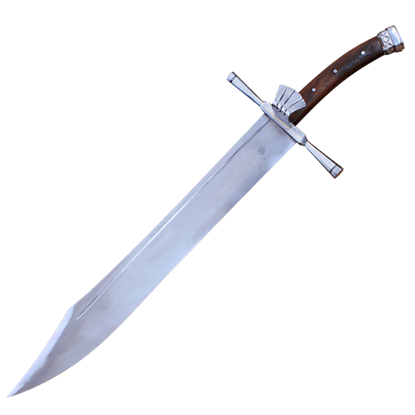 A spectacular weapon which replicates the styling seen in medieval era Germany, the Man at Arms Grosse Messer by Cold Steel is an enormous sword which is wieldable in either one or two hands and features a single razor sharp edge. Inspired by history and creative imagination, this Ring Hilt Swiss Saber with Scabbard combines the single-edged design of the historic saber with a twist of fantasy as well as hardy materials, creating a unique and functional sword. Inspired by history and imagination, this Ring Hilt Swiss Saber with Scabbard and Belt combines the single-edged design of the historic saber with a twist of fantasy as well as hardy materials, creating a unique and functional sword. The crashing of waves, the roar of cannons, the shout of rogues through the foreboding mist - the Scottish Cutlass cannot help but unleash adventurous images. Scottish born Capt. William Kidd would certainly have favored this sword. 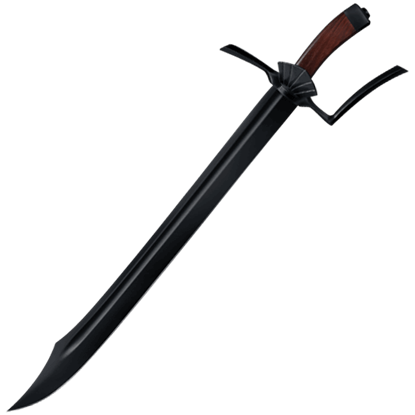 The grosse messer was a German blade designed to take the place of the sword as a side-arm. They were used by nobles and commoners alike, although This Messer Sword with Scabbard certainly has the look of a weapon fit for noble hands. 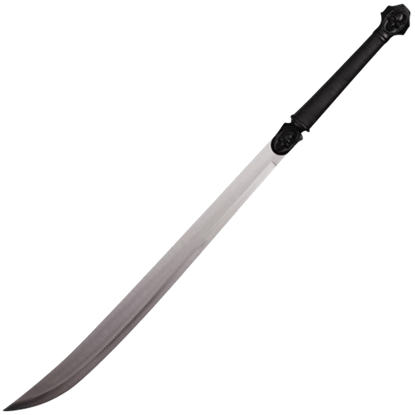 The grosse messer was a German blade designed to take the place of the sword as a side-arm. They were used by nobles and commoners, although This Messer Sword with Scabbard and Belt certainly looks like a weapon fit for noble hands. 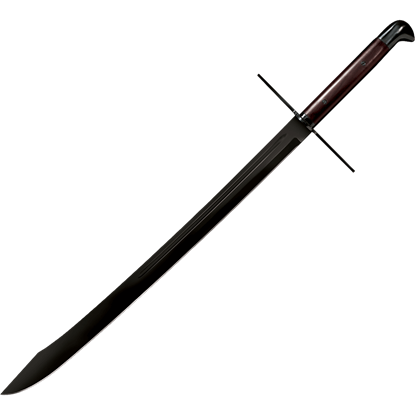 Similar to a fauchard or a glaive, the Warbrand sword is a single-edged weapon that was originally designed for striking an enemy on horseback. 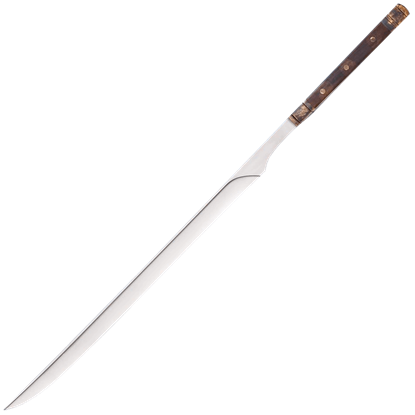 This Warbrand Sword is a stunning and sleek weapon that any medieval collector would love.